You'll find comedy clubs, bars, and nightclubs galore in Los Angeles, but sometimes you just want something a bit different. If you're not ready to go to bed after dinner and are looking for something fun, unique and exciting to do after the sun goes down, the city is full of lively places to hang out, spots with great city lights views, fun night activities, movie palaces that are worth seeing, and some places to get a meal after you're done with all that. Here are 20 great things to do in Los Angeles after the sun goes down. This charming covered farmers market is the place to buy fresh, locally grown produce in Los Angeles—with over 100 vendors. In the last decade, a high-end shopping enter was opened adjacent to the market. This is perhaps the only place where you buy 24 carrots then head next door to Barney’s to buy 24 carats. The Grove is a favorite of locals and tourists alike. Located next to Universal Studios Hollywood, this late night hot spot is home to lively restaurants and a movie theater. CityWalk also features attractions like indoor skydiving and mechanical bull-riding. Throughout the year, concerts and other live events are held in the open-air shopping center. No trip to Hollywood would be complete without a walk down the famous Walk of Fame. Spend time finding your favorite stars. Grauman’s Chinese Theatre at Hollywood and Highland is an exceptionally unique attraction, as its courtyard is filled with famous star’s footprints and hand prints. This Venice Beach street is only a few blocks long, but it's always packed in the evening. In addition to boisterous bars and acclaimed restaurants, the quintessential California-cool boulevard is packed with people shopping at trendy stores like Rag & Bone, Vince, and Warby Parker. This seaside amusement park hosts nighttime concerts throughout the year. While the series used to be held in the summer, it will take place in the fall as of 2018. Acts range from R&B to rock-and-roll, and the shows are free. If you are looking to party, some of the most infamous and raucous nightclubs in the country make their home along L.A.'s Sunset Strip, between Doheny Drive and Crescent Heights Boulevard. 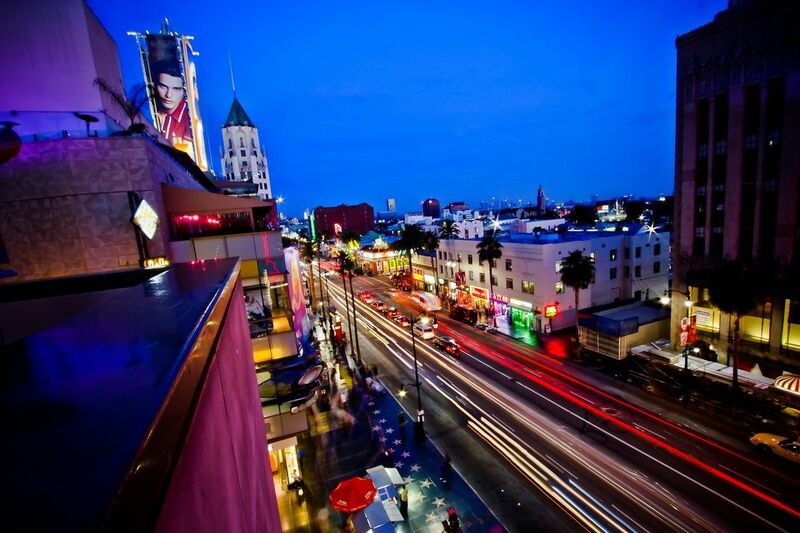 Here, you'll find everything from The Roxy to the Viper Room. Afterward, grab a snack at a favorite late-night haunt like the Pink Taco. The Griffith Observatory not only offers fantastic views of the stars above but of the "stars" below as well. The view from this famous vantage point provides an unparalleled panorama of the Los Angeles skyline. Come early—the road leading to the parking lot closes at 10 p.m. The view from Mulholland Drive isn't quite as spectacular as the one from the Griffith Observatory, but it’s a bit more accessible for some. This overlook closes at sunset, and it can get crowded, so make sure you come early. Once a month, local amateur astronomers set up their telescopes on the front lawn at Griffith Observatory. The expansive sky offers up incredible views of the star-filled sky. These parties give attendees and their families the check to check out the Sun, Moon, and other planets with high-powered telescopes. Long Beach is home to the Queen Mary, a retired British ocean liner that sailed for Cunard for decades. Now, the decommissioned ship hosts several night tours, including some that focus on her haunted history. You’ll get to explore the ship and hear stories about some of its most famous "inhabitants." Fewer and fewer sitcoms use live audiences these days, but you'll still find some chances to watch a television program being filmed. While many shows are taped throughout the day, often late-night shows will tape two episodes back-to-back, with one episode's taping running into the evening. These tapings can last up to several hours (a far cry of the hour you get to see on TV!) so be prepared. If you stay in their hotel or know a professional magician who can get you a pass, you can spend the evening in this exclusive magic club. It remains one of the most popular after-dinner destinations in all of Los Angeles. But be warned: The club keeps a strict dress code to maintain a classic Hollywood vibe—this means no denim or T-shirts. The Los Angeles area has no shortage of professional sports teams. With two professional teams each for hockey, baseball, basketball, and football, the chances of a game happening on a night that you’re there are very good. Hoping to catch a celebrity while you cheer on your favorite team? The Lakers at Staples Center will be your best bet. Grauman's is one of two classic theatres in Hollywood. Known for Hollywood premiers, its interior decor is Chinese-inspired. It's one of several theatres on the same spot on Hollywood Boulevard, so be sure to ask whether your show will be in the big Chinese theater before you go. Alongside the Chinese Theatre, the Egyptian theater is the second historic establishment along this strip of Hollywood Boulevard. Like its more famous neighbor, the Egyptian hosts retrospective film festivals and other screening. Even though it's not as well-preserved as the Chinese Theatre, the remaining details are gorgeous. For a smaller version of the grand Hollywood theaters, the Vista, located in Los Feliz at Sunset Boulevard and North Virgil Avenue is a throwback. This theater only has one screen, so you won’t have to argue about what to watch. Rich with Egyptian-style details, the Vista has preserved its own Hollywood "glam," with a courtyard of little hand and footprints out front, like the famed Chinese Theatre. Purchased by Quentin Tarantino from its original owner in 2010, the New Beverly recently underwent a remodel. The theatre is known for showing classics as well as oddball cult favorite films. It's one of the oldest revival theaters in the entire region. This spot, located just a couple of blocks from the pier in Manhattan Beach, is a late night go-to for all kinds of local characters. Open 24 hours a day, the Kettle opened in 1973 and has served locals and visitors alike ever since. This classic Jewish deli, founded in 1931, is open 24 hours a day, except on Rosh Hashanah and Yom Kippur. Come here for late night lox and bagels, corned beef, and matzoh ball soup. You can’t miss the giant neon sign out front. Pink's Hot Dogs, equal part hot dog joint and iconic L.A. institution, serving up late-night hot dogs and loaded chili-cheese fries. Most of its "dogs" are, not surprisingly, named for celebrities.